While we’re only halfway through the ten episode third season, things come to a head tonight in the battle between the brothers McGill. 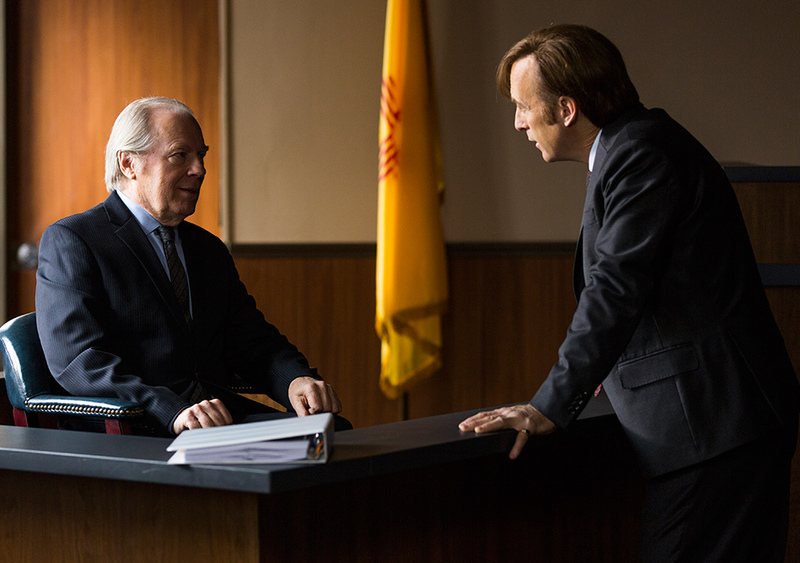 The lead-up the last few weeks has been to this: Jimmy’s hearing in front of the New Mexico Bar Association, an association stacked with people that either owe Chuck McGill their jobs, or who have a great deal of respect for his work as a litigator over the years. So how is Jimmy going to pull through? 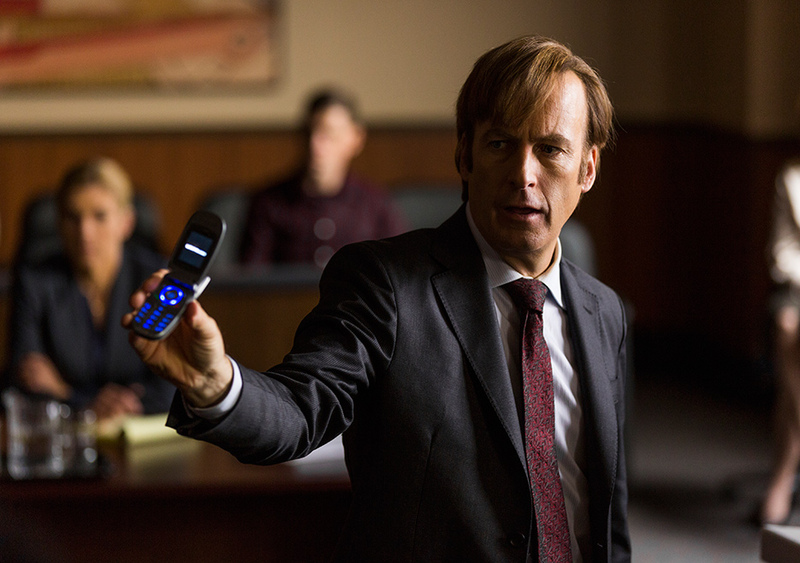 Before I begin the review, let me just get this out of the way: this is the single best episode of Better Call Saul so far, bar none. It brings to a culmination a tragic story of two brothers who both love and hate each other, with the elder, full of hubris, finding his schemes to destroy the younger backfiring on him and bringing him down to a tragic fall. 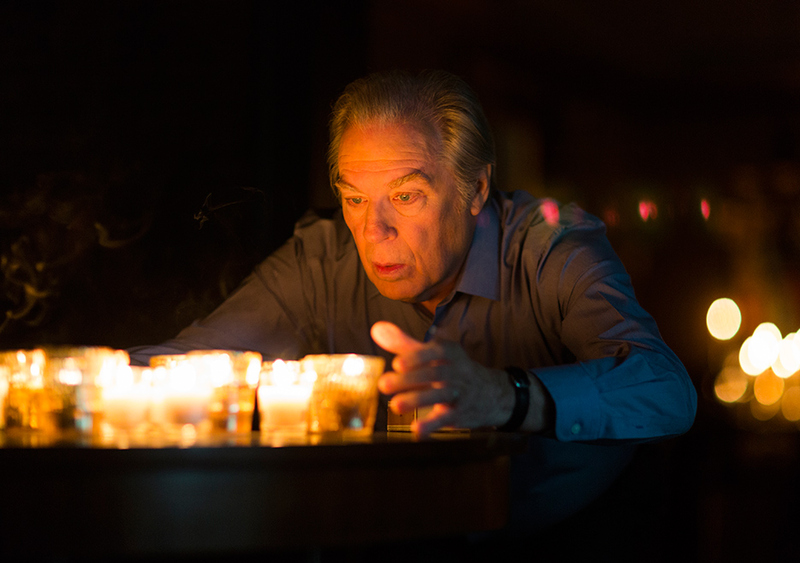 I love Michael McKean’s Chuck McGill, but man, I was so happy to see him finally break. And the best thing? Jimmy does not have the heart to gloat in the slightest, making me like him just that little bit more. Solid, solid television. Unlike the last few episodes, this one focuses entirely on Jimmy’s story – we’ll likely get more Gus and Mike next week. The episode opens on a flashback. This was unclear to me at first, and was something I only picked up on with certainty toward the end of the episode. Chuck’s ex-wife Rebecca is coming to town, and Jimmy is at Chuck’s helping organize a group of contractors who are trying to make Chuck’s house look relative normal: putting in lights, appliances, and other electronic devices. 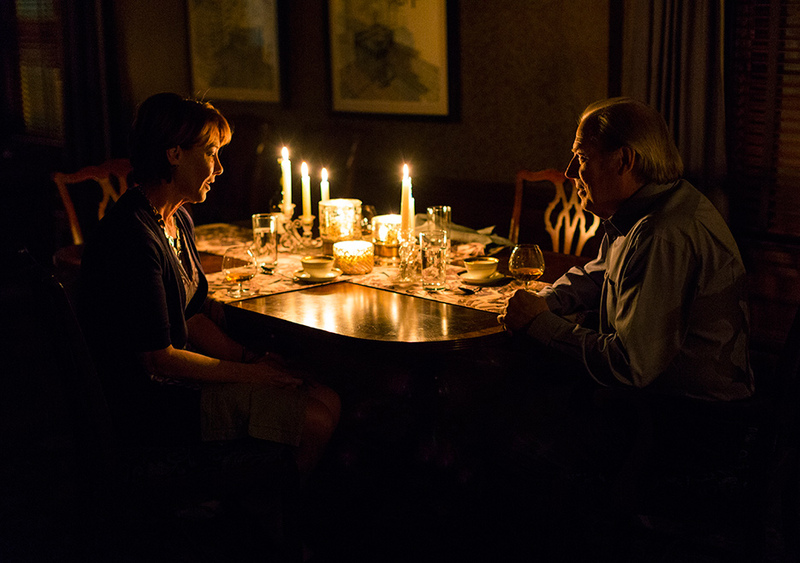 Chuck doesn’t want Rebecca to know about his illness, so he’s doing everything he can to set things up as though he’s having a temporary power outage, and Jimmy is right there getting things right for his brother. When Rebecca arrives, Jimmy jokes about going to a restaurant, but it’s part of the shtick. Chuck apologizes, but tells them it’s no problem to get dinner ready, and they stay in. Dinner goes very well, but when things are going right, something’s bound to go wrong. Sure enough, Rebecca’s cell phone rings, and Chuck begins to panic. He runs to the kitchen to get away and Rebecca, oblivious to his situation, follows. Unable to take any more of the pain, he knocks the phone out of her hands to the floor. She’s upset, but rather than explain his condition to her, he turns it back on her, saying that he finds it extremely rude to answer a cell phone call during dinner. 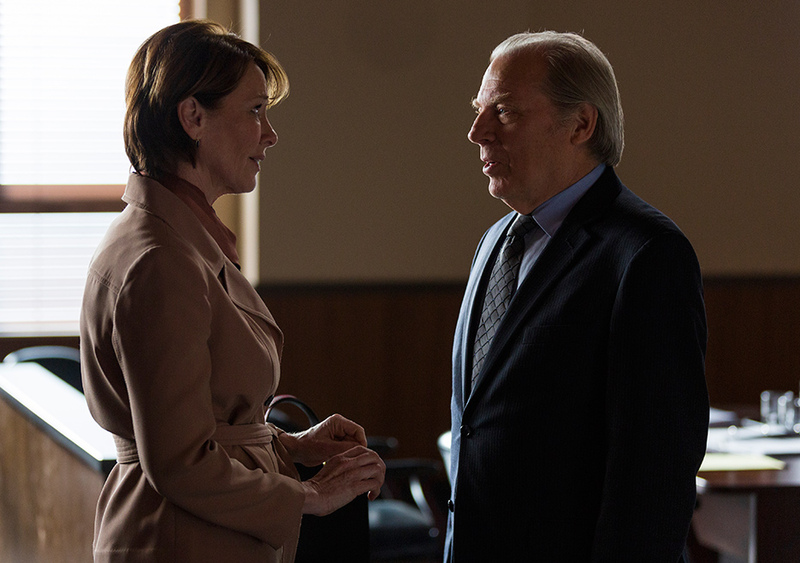 She apologizes – stiltingly – and tells the brothers she’s leaving. Jimmy’s reaction is telling – he asks Chuck if it’s more important to him to look like a prick and keep his secret than it is for him to be honest with Rebecca. He still won’t budge. This scene serves at least two purposes. First, it establishes yet again just how much Jimmy has done for Chuck over the period of his illness. Chuck is, much as Rebecca in his kitchen, oblivious to the pain he causes. He’s so caught up in his own world that he is completely unaware of the pain he’s causing others, and this in turn is a reflection of Jimmy’s own stoic silence in the face of his brother’s ignorance. 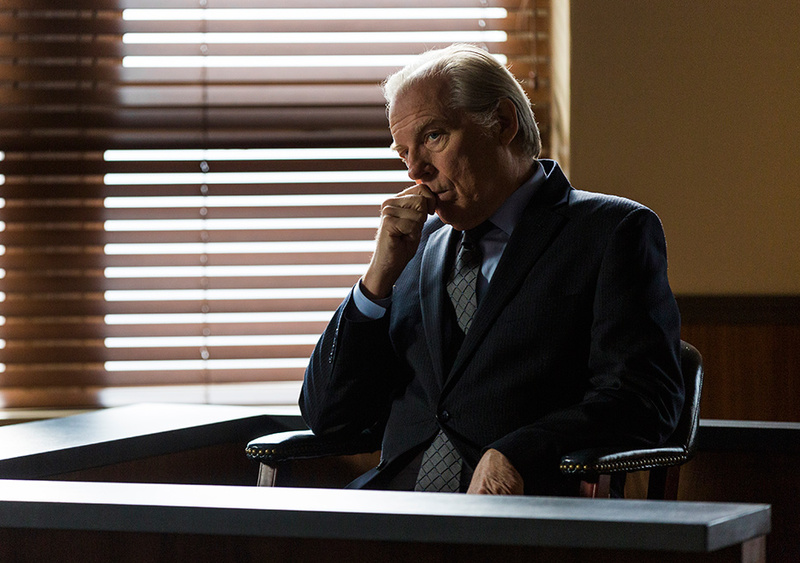 Second, it sets up Jimmy’s use of Rebecca later in the hearing in front of the Bar. The day before the hearing is to begin, Kim comes out of a meeting with the Mesa Verde people. She doesn’t look as happy as her clients expect her to be, so she explains about Jimmy’s situation and Chuck’s claims re: Jimmy’s manipulation of documents. They insist that they want her as their counsel, and she breaths a sigh of relief. While most of Jimmy and Kim’s scheme has been unfolding over the past few weeks, there’s one last piece they need to get in place. Jimmy visits Caldera, the veterinarian who’s more than a veterinarian, and he asks him for a guy for a five-finger job. “Does he need to fit into tight spaces?” “No,” Jimmy replies, looking a little confused. But there’s method to the good (bad) doctor’s question. Who do we see, later in the episode, bumping into Chuck as he climbs the stairs to the Bar hearing? Huell Babineaux. 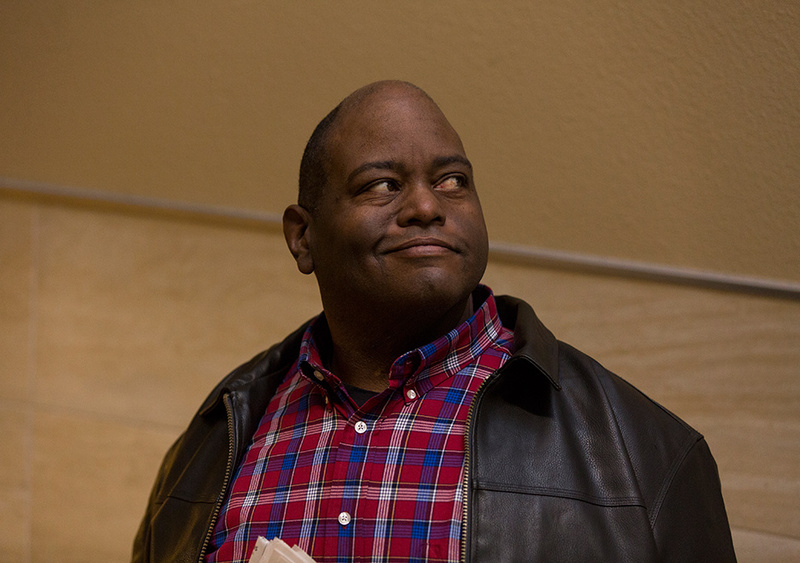 The very same Huell that we first met (will meet?) 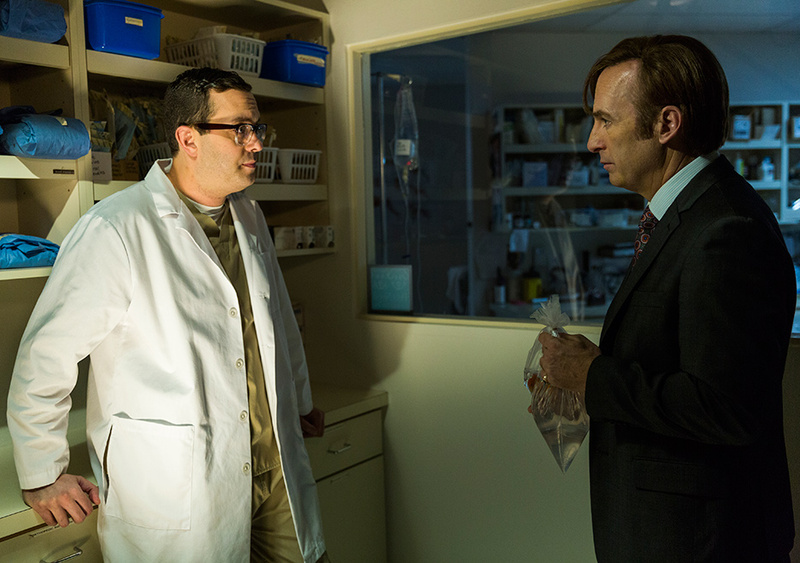 back in (later in) Episode 401 of Breaking Bad, when Jimmy (Saul) hires him as a bodyguard. It’s always a treat to see some of these BB characters showing up here. But the fact that we see him bumping into Chuck came as a bit of a surprise to me. I’d assumed, given Kim and Jimmy’s attempts to ascertain the existence of an additional tape, that they would be looking to lift that; however, there’s no way that Chuck would be carrying it with him to the hearing. So what is Huell doing? Turns out, it’s Jimmy’s cell phone battery, and he isn’t picking Chuck’s pocket at all – Huell’s planting the battery on him. Prior to the hearing, we get two quick scenes. The first is Howard Hamlin offering to keep Chuck off the stand – he points out they have a solid case without needing Chuck to show up; but Chuck’s hubris has blinded him, and he insists that he needs to be there, to see justice done. 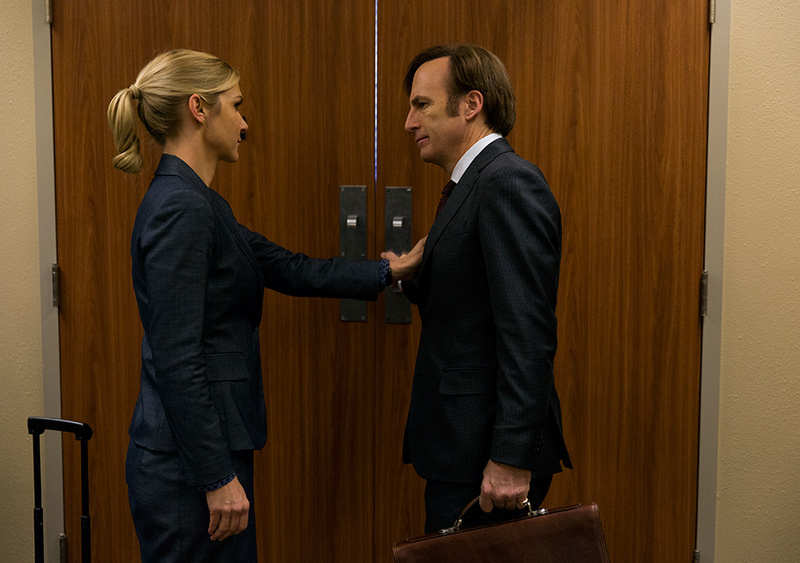 The other scene is a montage of Kim and Jimmy getting ready for the hearing, as we listen to the Bar prosecutor in voice-over, presenting his opening statements. During the hearing, Jimmy keeps trying to stall. Francesca (his office assistant) shows up, and tells him the flight is delayed 40 minutes. What flight? It’s one with Rebecca on it. He’s asked her to come to the hearing, and she has no idea what she’s walking into. Full circle from the opening sequence. The hearing is going clearly against Jimmy. Despite his stalling, he’s not coming across as particularly sympathetic. And as he and Kim sit there listening to the tape playing, you can see them almost shrink into their seats. Now, as a viewer who is biased toward Jimmy, listening to the recording reminded me how clearly, Jimmy is trying to make his brother feel better, to pull him out of his self-loathing despair. The angle that Jimmy takes – that this is a case of him lying to protect his brother – makes perfect sense given the context. But the board isn’t on-board. Rebecca arrives, and she’s shocked. Chuck asks for a recess, and is granted one (despite Jimmy having just been told to keep going moments before). He explains to Rebecca about his condition, and is very insistent that it’s physical, not mental. This is when Jimmy begins to put on the pressure. Upon the restart, he begins to question Chuck about his illness, and the state of his home. He enters into evidence the photos that Mike took while fixing the door, but nothing he says phases his older brother – he insists that everything he’s doing, is for love of his brother, and for love of the law. Unable to get Chuck to break, nor to get the board on his side, he finally pulls out his trump card: his cell phone. After establishing that Chuck views his illness as purely physical and undiagnosed, something that he likens to the time it took to recognize AIDS or HPV as diseases, and that said illness causes him actual, physical, pain, Jimmy pulls out his cell phone. Chuck momentarily pulls away in apparent pain, before calling Jimmy’s bluff: the phone has no battery in it. Chuck laughs at him and calls it a “sorry little trick,” but Jimmy doesn’t change expressions. Instead, he asks Chuck to check his breast pocket. Inside, Jimmy’s cell phone battery. Chuck looks panicked – he’s suddenly lost. And then he breaks. Jimmy clicks the battery back into his phone, and points to Huell, claiming that he’ll testify to having placed the battery in Chuck’s pocket an hour and a half ago – “One hour forty-three minutes,” Huell corrects. Chuck starts to rant: “I am not crazy! I am not crazy. I know he swapped those numbers. I knew it was 1216. One after Magna Carta. As if I could ever make such a mistake. Never…never! I just…I just couldn’t prove it. He-he-he covered his tracks, got that idiot, at the copy shop, to lie for him.” The prosecutor tries to stop him, but Chuck is beyond hearing. “You think this is something, you think this is bad? This…this chicanery? He’s done worse. That billboard. Are you telling me that a man just happens to fall like that? No. He orchestrated it. Jimmy! He defecated through a sunroof! And I saved him! And I shouldn’t have. I took him into my own firm. What was I thinking? He’ll never change. He’ll never change. Ever since he was nine, always the same, couldn’t keep his hands out of the cash drawer. But not our Jimmy. Couldn’t be precious Jimmy. Stealing them blind. And he gets to be a lawyer?! What a sick joke! I should’ve stopped him when I had the chance! And you,” he turns to the board, “you have to stop him.” The board looks on, completely stunned. So is everyone else in the courtroom. Rebecca is hiding her face, Hamlin looks dumbstruck, and Kim and Jimmy both look just plain sad. Chuck recovers himself, apologizes for his outburst, and asks if Jimmy has anything else. “No, nothing further,” Jimmy replies. The camera pulls out to a long shot of Chuck, sitting gape-mouthed staring at the humming exit sign, as the camera slowly pans upward. He’s a completely broken man in this moment. This story of two brothers who both love and hate each other, who support and undermine one another, has all the weight of a Greek tragedy at this point – all we’re missing is the chorus. This is a classical case of one man’s hubris undoing his position of righteousness. There is no question that Jimmy has done bad things in the past, that he has exhibited poor, even bad, judgement. But this is the only Jimmy that Chuck is capable of seeing. The Jimmy that reformed, that became a hard worker, that put himself through law school and passed the bar, this is not a Jimmy that Chuck is able – or willing – to see. Chuck has an entire narrative that he’s built over the years, that of the elder brother trying to guide the wayward brother, and he’s unable to adapt the story to changing circumstances. Jimmy, despite the fact that he clearly is guilty of malfeasance, is thus able to gain the moral high ground in this fraternal fight to the death. And do not mistake the result of this moment: Chuck has clearly shown himself to be mentally incompetent, and Jimmy is going to come out the winner of this hearing – but at what cost? To think that this moment came after two and a half season is to realize the slow burn that Gilligan and Gould have – exquisitely – subjected us to. From very early on, it was clear that there was tension between the brothers, and last season, we found out that the reason Jimmy was never offered an associate membership at Hamlin, Hamlin, McGill was due to his brother’s veto. Despite this betrayal, Jimmy continued to work with and help his brother, although he withdrew from some of his day-to-day aid. Yet, when crises arose, he was there, as a good and loyal brother should be. While it would be tempting to look at Jimmy’s destruction of his brother as a Cain and Abel story, I think that the roles are actually reversed here. While Cain (Jimmy) appears to strike down Abel (Chuck), the real betrayal comes from Chuck’s years of undermining Jimmy behind his back. This nearly destroyed Jimmy last season as he was pushed off of his own case, and the final straw for him was Chuck and Howard’s theft of Kim’s personal baby, Mesa Verde. He was able, though unhappy, to deal with his brother betraying him; he couldn’t stand for him betraying Kim as well. It will be interesting to see what happens next week, as despite thoroughly destroying his brother, Jimmy is still facing discipline of some sort or another. He may be able to avoid the felony aspect of things at this point, as he’s clearly painted Chuck as mentally ill, and his actions as being intended to appease a troubled mind. But the fact is that he signed a confession, and thus all he can do is mitigate the results. Stay tuned next week – I don’t think Jimmy’s entirely out of the fire yet.